Lotus is a famed British car manufacturer notable for a string of successful, lightweight performance sports cars. They have had also enjoyed outstanding motorsport success in Formula One motor sport around the world. Today Lotus is a highly respected manufacturer of lightweight sports cars and a leading automotive engineering consultancy. Although it has sometimes struggled to make the sums work over the years, its technical brilliance has always shone through – and its story is a tale of lightweight design and handling. Two engineering graduates of University College London, Colin Chapman and Colin Dare, formed Lotus Engineering Ltd in 1952 (using a £50 loan from Chapman’s future wife, Hazel Williams). Chapman was a motoring enthusiast, building his first trials car in a lock-up using only a power drill and basic panel beating skills. Together the pair made their first venture in the business world selling second hand cars between lectures. Chapman believed that sports car design should favour a lower weight, to improve handling, rather than outright horsepower. His speciality was aluminium construction – learned from working at the British Aluminium Company where he gained valuable knowledge of aircraft technology. Chapman’s mantra was ‘simplify then add lightness’ and this ethos has been integral to Lotus cars ever since. In 1952 the Lotus Mark VI was developed, built in part to finance Chapman’s motor racing ambitions. Uniquely it was not sold as a complete car but as a kit car, which enthusiasts could assemble themselves. It had a top speed of 93mph, a 0-60 time of fifteen seconds and was based around parts for the Ford Prefect, with mounting points for several different engines. Like Chapman’s other designs it was very lightweight and came complete with all the parts necessary to build. Though the Mark VI was sold as a road car, it was at home on the racetrack and quickly became a favourite for club racers. 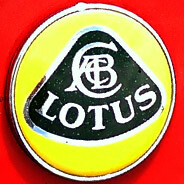 It’s believed Colin Chapman designed the Lotus badge. It’s said that the original badge, featuring a racing green lozenge on a yellow background, represented the sunny days that Chapman hoped would lie ahead for his company. The ACBC lettering above the word Lotus are Chapman’s initials. These initials stood for Anthony Colin Bruce Chapman and are actually bigger than the word Lotus. As Lotus changed ownership, changes to the logo were made. The first significant change came in 1968, during a period following Jim Clark’s death at the wheel of a Lotus Formula 2, when a black coloured logo appeared. The next big alteration was the removal of Chapman’s initials in 1984, when David Wickins became chairman of Lotus. It wasn’t long after this that General Motors bought Lotus and restored the initials. In 1988 the badge was returned more or less to its original form and has stayed the same ever since. 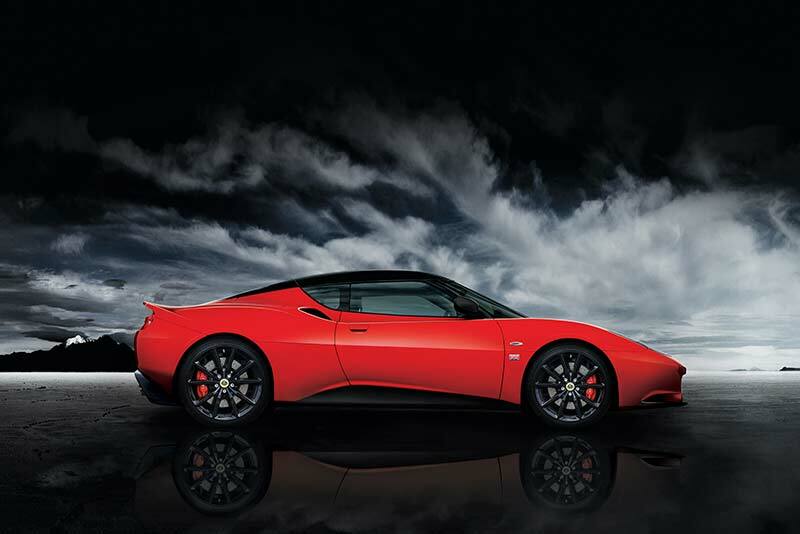 Lotus is based in Hethel, Norfolk, and is now owned by DRB-HICOM via its subsidiary Proton. It is classed as Group Lotus and is comprised of Lotus Cars and Lotus Engineering (the latter encompassing the engineering consultancy arm of the brand). Lotus fans have the choice of a number of Car Clubs in the UK and worldwide. Please see our Lotus Clubs page for more information. Lotus currently manufactures the Elise, Exige, and Evora sports cars.